It's Labour weekend this weekend, the traditional time for New Zealanders to plant out their tomato plants. This brings me great relief, because I raised about 60 tomato plants this year - a few for us, but most to sell to raise funds for our local environment society. It was a lot of work, but fun. The seeds were sown in late August, and for a month or so the pots were brought in every night into the warmth, then put outside again each morning. Then the plants had to be repotted as they grew bigger. May I say how fantastic they were? I checked our local garden centre to figure out how much to charge, and we came up with a price that was half theirs, but our plants were twice as good. What a relief it was to load them into the car yesterday for the market we sold them at. I helped set up the stall, but the selling was done by some faithful supporters, and we raised a bit of cash. Anna came along too, and together we happily inhaled the scent of tomato leaves as we drove there. A quick aside to mention what tomatoes we're growing: for the market it was Gardener's Delight, a cherry tomato ("sweet grape-like trusses," says the blurb). We kept a couple of them. We've also got Tomaccio, at a mere $5 for just two seeds, but I tasted a friend's last summer, and with the memory of raisin-like sweetness on my taste buds there was no stopping me. Yes, both seeds sprouted and the plants are flowering. Plus we've got another new cultivar for us, Baxter's early bush cherry - tomatoes by Christmas, anyone? - and an old heritage favourite, Brandywine - for sheer flavour power, as the sales blurb goes. 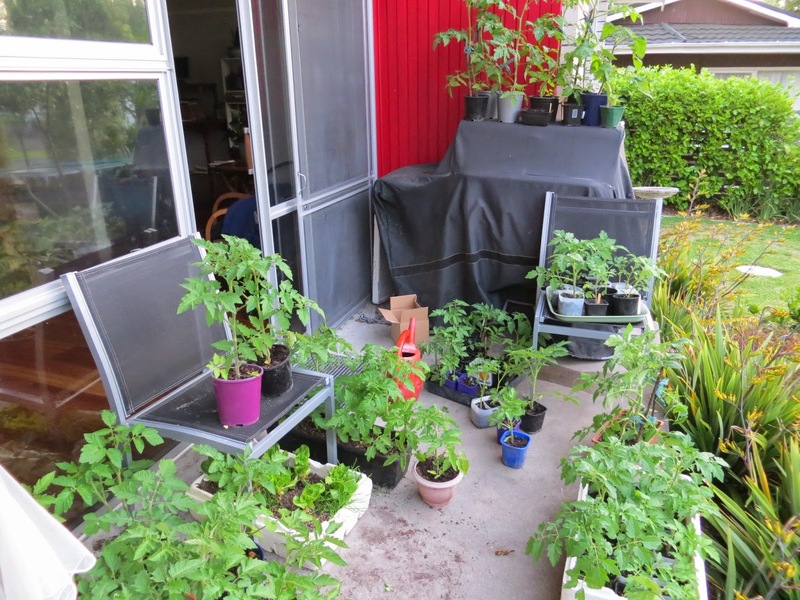 · Make sure your tomato pot is well watered at least 30 minutes before planting. · It’s good to bury the first few centimetres of stem into the soil. When you do this, the tiny hairs on the stem turn into roots, so you get more roots to absorb moisture and nutrients. 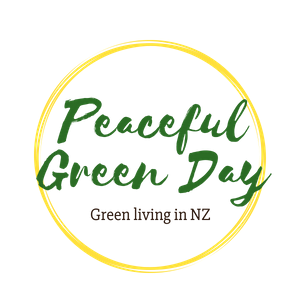 · Mix plenty of compost into the planting hole, and maybe some sheep pellets. 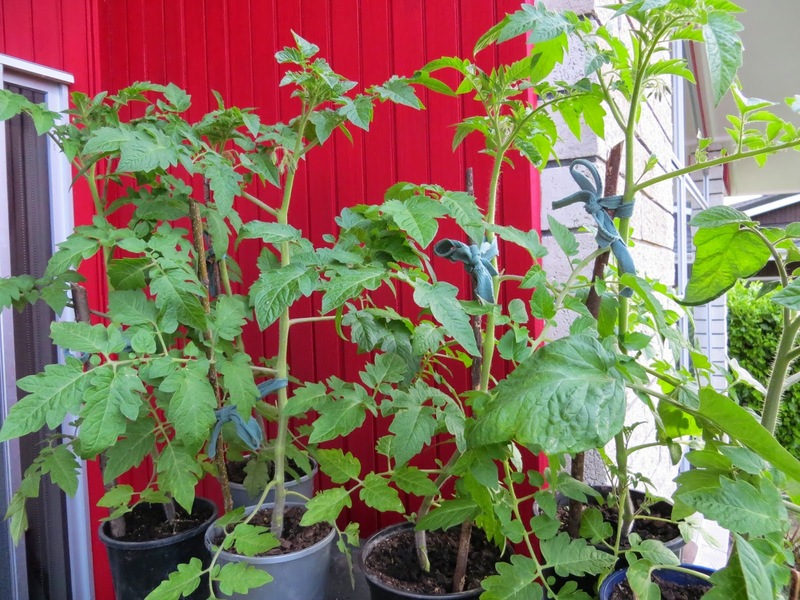 · Place a tall stake or two next to the plant (about 20 cm away from the stem) at planting time. As the plant grows tall, tie it to the stake(s) to support it. Cut old clothes and rags into strips to make soft, free plant ties. · After planting, water well. When the soil is very moist (ideally after a good rain fall), cover the soil around the plant with mulch (e.g. pea straw, old leaves, or whatever you can get your hands on) and immediately water the mulch so it doesn’t blow away. Mulching keeps the soil and plant much healthier, especially when the weather gets very hot later in the season. 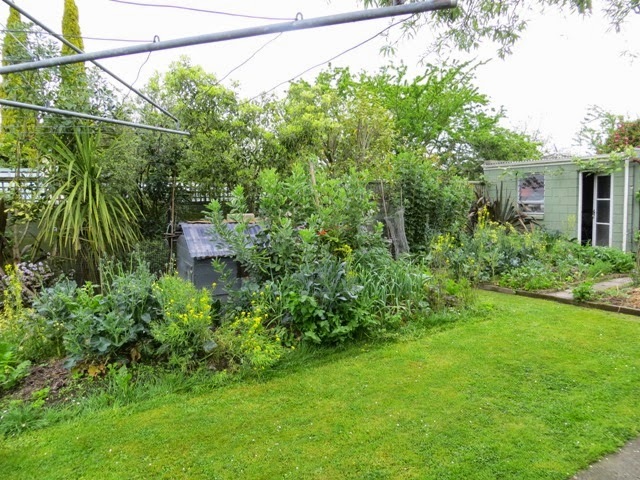 · Many gardeners pinch off some of the lateral branches. These are the ones that grow out of the plant at about 45 degrees. The emerge in the right angles formed by the stem and a branch that grows straight out. There are different schools of thought on this – you could Google it! But if you let all the branches grow, you’ll need a lot of stakes. quintessential kiwi backyard accessory, the rotary clothesline. It's utterly practical, if space allows. Have a lovely Labour weekend, in and out of the garden!